It’s National Indian Pudding Day, at least according to Yankee Magazine. This wasn’t something I grew up with at all, but I’ve quite enjoyed it since moving to New England all those years ago. Of course, I’ve made some changes to the recipe since I first saw it, and I just love this version of doing it in the crockpot. I’m not a huge fan of molasses, and I love maple syrup. I also love the flavor combination of cardamom, ginger, nutmeg and vanilla. I make ice cream with those spices that I call The Flavor Bomb. This pudding reminds me of that. Grease the inside of your slow cooker with butter and preheat on high 15 minutes. 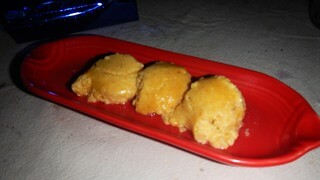 In a large, heavy-bottomed pot, whisk together milk, cornmeal, and salt, and bring to a boil. 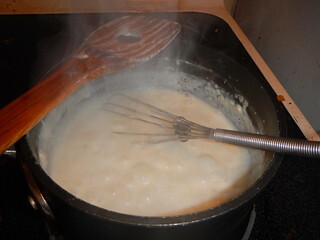 Continue whisking another 5 minutes; then cover and simmer on low 10 minutes. Remove from the burner and add butter. In a medium-size bowl, combine eggs, maple syrup, and spices. Add a small amount of the hot cornmeal mixture to the egg mixture to temper the eggs, then transfer the egg mixture into the pot. 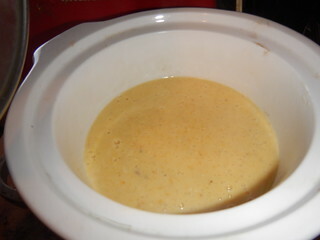 Incorporate the egg mixture into the cornmeal mixture well, then scrape it all into the slow cooker. Cover and cook on high for 2 to 3 hours or on low for 6 to 8 hours. The longer you have, the better the texture will be, and the more the custard will set. It will pull away from the sides when it’s finished. The tops and sides will be more solid than the center. It’s definitely a custard — a corn custard that is just delicious. 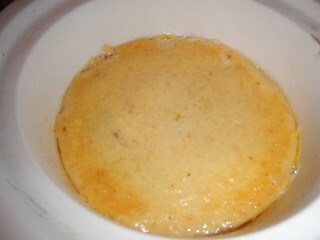 But don’t expect a bread pudding type of texture, this is very different. Serve warm. For a dessert, some people like to put heavy cream, lightly sweetened whipped cream, or ice cream on top. I don’t like it that sweet, myself, so prefer it just as it is. I think it is a fabulous breakfast food, actually. Cooked on low all night long, it’s got a lovely texture by morning. It has milk and eggs, so plenty of protein, and using maple syrup gives it that breakfast feel to it. Perfect with a strong cup of coffee.